When it comes to adding a pet pooch to the family you want to make sure you are offering it a great life. Whether you have purchased a brand new puppy or have adopted one from a kennel or bad home, they all deserve a great amount of attention and care. 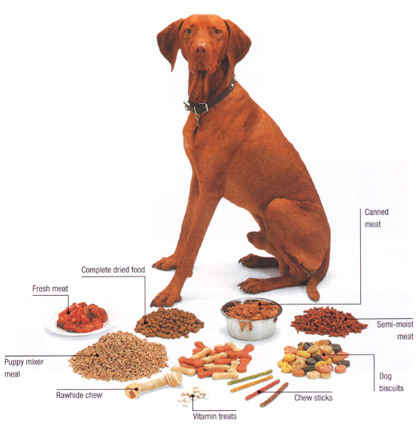 You want to make sure that it is as fit and healthy as possible, so what dog food should you be giving them? Out of dry and wet food is there a winner that will give your dog the right nutrients it needs? Some dog owners can steer away from the wet food option as rumours fly about that it isnt very good for your dog compared to dry food. However it poses benefits that your dog wouldnt receive just eating dry food. First of all the food has less carbohydrates and it makes a great option for overweight dogs because the moisture content of the tinned food can make the nutrients add up to a larger amount. This will make the dog feel filled up quicker in turn making it eat less, hopefully losing a bit of weight over time! As well as lower carbs, it has a much higher amount of protein than dry food which is really important for a dog. Dogs are carnivores and their teeth were designed to eat meat therefore the more you can give them the better. It is also a much tastier meal for them and they will enjoy it a lot more! Tinned dog food also doesnt have synthetic preservatives put into the food; the food is sealed away in an air tight container so will have a long shelf life. However once the tin is open it needs to be used right away ideally. If you have only used half of the can then it will need to be put in the fridge and then used within 2 to 3 days. Wet food is putting up a good case so far and dry food does have a tough battle to compete with it! It does have some positive points of course and one that is more appealing to the owner than the dog is the cost. Overall dry food is the more cost effective option of the two as it lasts longer once opened and you can buy large bags at great prices. If you put food out in their bowl before you leave them in someone elses hands, dry food would be the best option. Wet food should only be in the dogs bowl for a couple of hours (if it lasts that long!) because it can easily pick up germs and become spoiled. So if you leave your dog with your kids or someone who wont pay attention to their eating habits whilst you are out, dry food is the best option. It is clear to see that wet food has a lot more positives than dry food, but the best option is to buy both and combine them. Leaving dry food out throughout the day as a snack if they are hungry is a really easy option and will keep them feeling full. Then when it comes to the evening you can put out half or a full tin of wet food for them to gain the right nutrients. If you feed them some dry food throughout the day they might not be so hungry on a night so you could give them half of the tinned food, put it away in a mini dog fridge and you will save money and the dog will be getting the best of both worlds! Zoe Robinson is an enthusiastic writer in the subject matter of pets and pet food. The websites recommended by Zoe have been thoroughly researched and come highly acclaimed from direct experience. Take a look at a range of Eukanuba dog food for your pet pooch today.